GracePoint Church and Christ the King Lutheran Church are partnering together to provide the New Brighton community a safe place to go and grow in their individual recovery of hurts, habits and hang-ups. 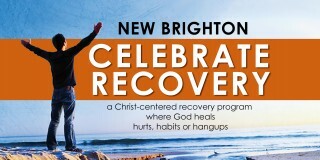 The purpose of Celebrate Recovery is to encourage fellowship and to celebrate God's healing power in our lives as we work our way along the road to recovery. We are changed as we share our experiences, strengths and hopes with one another. In addition, we become willing to accept God's grace and forgiveness in solving our life's problems. By working through the principles, we grow spiritually, and we are freed from our hurts, hang-ups and habits. This freedom creates peace, serenity, joy, and most importantly, a stronger personal relationship with others and our personal, loving, and forgiving Higher Power, Jesus Christ.